Just imagine that you booked your ultimate golf bucket list trip. Maybe you chose somewhere like Pebble Beach, St. Andrews, TPC Sawgrass or Pinehurst. You’re probably excited beyond belief. A vacation with your friends or family playing the course you’ve always dreamt about playing. That is, until you start thinking about the travel aspect of it. More specifically, how to travel with your precious golf clubs. Because let’s face it, if you’re going to play a once in a lifetime course you need to play with your own clubs. This isn’t a time to try out some generic rental clubs. Luckily, traveling with golf clubs doesn’t have to be as bad as it seems. While we’ve talked about traveling with your clubs, I want to dive into the best golf travel bags for 2019. There are so many choices out there that if you haven’t bought one yet, I want to make sure you get the right fit for your game. 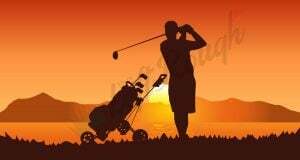 I’m confident after reading these you’ll find the one that will help get your clubs to your dream destination or just safely to your next golf adventure. If you’re new to the golf travel bag scene, you’ll quickly learn there are a ton of choices out there. From buying locally at a sporting goods store, on Amazon or somewhere else, there is no shortage of selection. Here’s what you should compare when picking out your first golf travel bag. The first thing you’ll notice about the wide selection of golf bags is the case structure itself. Some of the cases are hard while others have a soft case. Both have their pros and cons depending on your golf travel needs. The main pros of soft cases are that they are usually cheaper and easier to transport, especially if you have a smaller vehicle. Plus, they’re easier to store in your garage when you’re not traveling. Hard cases on the other are usually much bigger and heavier but also have more protection for your golf clubs. I’ll review the best golf travel bags for both soft and hard shells so this is more of a personal preference than anything else. The next most important factor for picking out your golf travel bag is ensuring its durability and padding inside to protect your sticks. Whether you choose a hard shell or a soft shell case, I always recommend a Bag Boy backbone travel cover support system. This makes it less likely for your clubs to get damaged when handled at airports and thrown into cars or vans. The last thing you want to have to deal with when you’re out of town is a snapped driver shaft. Make sure you snag one of these on Amazon to ensure your clubs are protected and not crushed. Another big factor is the price of the bag. You’ll see these bags range from pretty inexpensive all the way up to the $500 range depending on the model and brand you choose. It’s important to find a bag that fits your budget but will also last a long time. Don’t go cheap and then have to replace it every year. Remember, this travel bag will protect the clubs that you probably spent thousands of dollars on. Don’t get cheap now and suffer when something happens to them in transit. Depending on how frequently you travel, it’s important to get one that relatively easy to transport back and forth. If you’re older, I recommend getting a lighter, soft shell bag to ensure you don’t hurt your back getting the clubs in and out of the trunk. Another important factor is the amount of storage within the bag itself. This is one area where the soft cases usually win as they have 2-3 extra pockets outside the bag to house balls, golf shoes, and other accessories. It’s important to remember to always check airline rules when it comes total weight for your golf bag. Usually, if its over 40 or 50 pounds, you’ll have to pay an extra $25 to $50. The last factor when selecting from our list of the best golf travel bags is the warranty. You want to make sure company behind the bag offers a warranty in case something happens. This is more important with soft shell bags as they can get holes and tears while hard-shell bags seem to last a lot longer. Now that you know what you’re looking for before you buy, here are the best golf travel bags for airlines in 2019. The CaddyDaddy Golf Constrictor 2 travel bag is a great bag that I’ve personally used for the last 18 months. I’ve got hands-on experience with this one and they’ve helped get my clubs all over the country including an epic trip to Pebble Beach and Spyglass Hills. With 3 outside pockets, there is plenty of room to house my clubs, shoes, rain gear and more. It’s super easy to fold up and put in a storage cabinet in the garage. Another huge pro is the 8.5-pound design so I’ve never had a problem loading it up with gear and ever going over 37 pounds or so. The major downside is the lack of reinforcement around the clubs themselves. There’s very little padding next to the heads themselves so make sure to pack them with extra towels for protection. Lastly, the material isn’t the highest quality when compared to some of the others on this list. If you’re only traveling a few times a year and want a budget-friendly bag, this is a phenomenal option. It’s pretty inexpensive, it’s lightweight, easy to store and has tons of storage. This is a great option for most golfers. If you want more info, check out my in-depth review of the CaddyDaddy Golf Constrictor 2. Yes, Amazon basically makes everything at this point. When they notice an item is consistently selling they’ll create their own “Amazonbasics” model for it, including a low-priced golf travel bag. The AmazonBasics soft-sided travel bag is very affordable and has a ton of perks for such a low priced golf bag. Aside from price, the biggest pro is the durable nylon fabric and ability to stand on its own even when clubs are inside. It’s also got a ton of storage with two massive outside pockets. Plus, it has a ton of padding to protect your woods. Some of the negative reviews talk about wheels falling off and ripping relatively easily. Luckily, users have gotten replacements but it’s still more work and hassle for you. At such a low price it’s a great buy with little risk as the investment is so small. Overall, it’s ranked very high by golfers worldwide and an easy choice if you’re not traveling often. The Ping Rolling travel cover is another top choice among golfers worldwide as the bag is extremely easy to get your clubs in and out of with ease. The soft shell case is made of a very durable material and there is a ton of padding to make sure your clubs travel safe. The Ping bag is also great because it’s a 4-wheel design which makes it easy to push or pull the car through an airport. It’s very well designed with quality material that looks very durable, a side zipper, and compact when storing in your home or garage. The biggest downside is the minimal extra space for your gear. If you’re packing rain gear or other clothes, this might not be the best bag as it doesn’t even have a shoe pocket either. The bag is a solid choice but the biggest concern is the lack of storage including a separate shoe compartment. This makes it a pain if you have to put your shoes in your suitcase as they take up a lot of extra room. The SKB Deluxe ATA golf travel bag looks more like a weapon for war than for carrying golf clubs. It’s design is a bit obnoxious but it’s not focused on looks but simply one goal: protecting your clubs from the woes of traveling! Durability, durability, durability. This hard shell bag seems unbreakable. It’s made of polyethylene which keeps moisture and dirt out. The makers of this product are so confident on it they offer a $1500 club coverage and a million-mile guarantee. Offering that kind of guarantee comes with a heavy price as the bag itself weighs 18 pounds! As the average of clubs and gear weighs another 25-35 pounds, this makes it easy to go over the 40-50 airline weight limit. The SKB is made of durability and works for both stand bags and cart bags but a little tight with bigger cart bags. They also have a TS lock which makes it more likely to be searched so don’t put too much else outside your bag itself. Overall, this is the best hard case on the market with the only con being the weight. Pack accordingly! The Sun Mountain Clubglider Tour Series is travel bag for the serious golfer who doesn’t want to risk anything when they’re traveling. If you’re a very serious player who’s invested a lot (i.e. PXG golf clubs) this is the bag for you. With the 4-wheel design and overall look plus durability, this is one of the best golf travel bags for so many reasons. It has some of the best protection available and has some of the highest reviews on the internet. Not only is durable but it’s aesthetically one of the best cases to look at. The biggest con for most players is the sheer price. This is one of the most expensive in the market. Some reviews said the release mechanism is a bit stiff when opening and close and the main zipper isn’t that accessible. Otherwise, the internet didn’t have too many negatives for this epic golf bag. The 4-wheel make transporting it incredibly easy and the extra storage makes it easy to transport all your gear. Plus, this item comes in all black or a black/white version as well. Both are super clean and easy on the eyes. If you can afford it and are serious jet-setter, this bag is well worth the price. The Club Glove Last Bag is another trusted golf bag that is used and trusted by pros on many of the biggest tours so it had to make this list. It’s made of cordura which is much more durable than nylon and provides a ton of protection for a soft shell case. Plus, it’s so big it makes it easy to transport tour and cart bags easily. It’s made in the USA and everything from the material to the zippers and clasps are made with super high-quality material. It’s super easy to get your clubs in and out and there’s one main zipper. Plus, the bag comes in 16 colors so it makes it easier to identify it in the airport carousel. When it comes to soft shell cases there really isn’t much wrong with this as far as storage, weight, and looks go. The only downside is the price. As with the Sun Mountain, this is one of the more expensive golf travel bags available. There is also a Club Glove Last Bag XL Tour pro version that’s even bigger and offers all the same benefits. At only 9 pounds it’s still incredibly light and easy to transport with ultimate protection. Both of these models are great selections but it’s pricey. If you’re looking for a reliable bag and travel frequently with a cart or tour bag, this one’s for you. Remember, don’t skimp on quality for price when it comes to protecting your sticks! Lastly, the Caravan 3.0 is another great option for getting your clubs from A to B with consistency. It’s well priced and has a lot of perks for that low of a price point. The soft shell case has a strong polyester blend material that makes it very durable. It also had additional padding on the top to protect your clubs and not pack it with a bunch of towels. Plus, the two outside pockets make it easy to store a ton of gear easily. Some reviews have said it doesn’t last a long time so it’s best for the occasional golf travel and not the weekend jet-setter. This product is very comparable to the Caddy Daddy and really comes down to price and looks if you’re comparing side by side. It’s a budget-friendly bag that’s great for the light traveler. Regardless of the bag you pick from this list, make sure you use these tips to ensure you end up getting your clubs to the destination safely. Detach woods if you can. Store them in the pockets of your bag itself or separate, checked bag to save room and reduce weight. Use towels or bubble wrap for irons or other clubs. 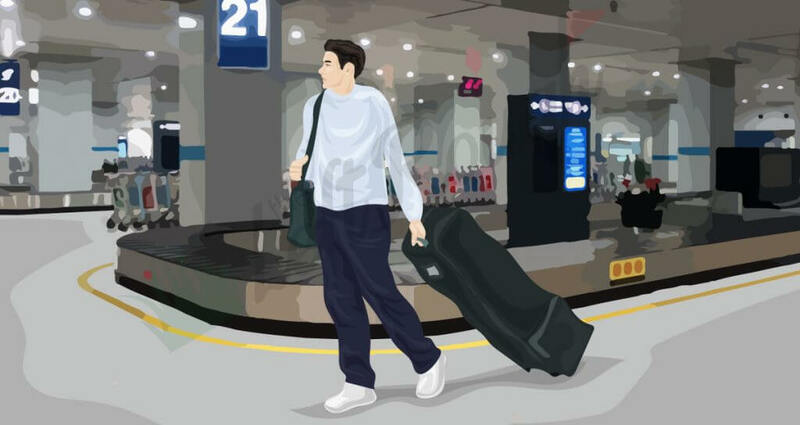 For more traveling tips and information, check out our full guide on How to Travel with Golf Clubs. Remember, selecting the right travel bag is all about protecting your clubs and sticking to a budget. If you’re going to golf and travel your #1 priority is to make sure they ended up at the course safely. A broken wood can ruin your mood and round that you might have spent a lot of money towards. Pick up one of these golf travel bags so you can start playing new courses in 2019 and start enjoying golf more than ever before.